Yes, even eBay has a rewards program. For the uninitiated, a loyalty program is a cashback, discount, or bonus program designed by a brand to reward their loyal customers — to keep you coming back. Usually the more you spend, the better the bonuses. That’s how it works with eBay Bucks. If you begin to spend regularly on the site and pay through PayPal, no doubt you’ll come up on eBay’s radar and they’ll send you an invitation. If you’re not at that point (yet), drive your browser to the eBay Bucks FAQ (Frequently Asked Questions) Even and discover all the ins and outs. Enroll to save two percent, right here! Even if you’re not a big shopper on the site, getting two percent back for qualified purchases is still not a bad deal (especially these days). As long as you earn more than $5.00 from purchases per calendar quarter, your two percent back can be used on eBay during a pre-designated time span after you earn it. Your qualified purchases, after you sign up, are totaled by each calendar quarter. 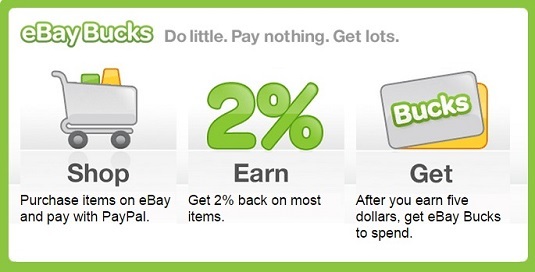 You can check your progress by clicking the eBay Bucks link in your My eBay: Buy section. Then eBay sends you an eBay Bucks Certificate to apply to purchases in the next calendar quarter. You can’t save up the certificates, though; they expire after 30 days.